Rumor spreading fast via Twitter on Sunday holds that THQ has canceled its entire 2014 slate of releases to position the company for sale. 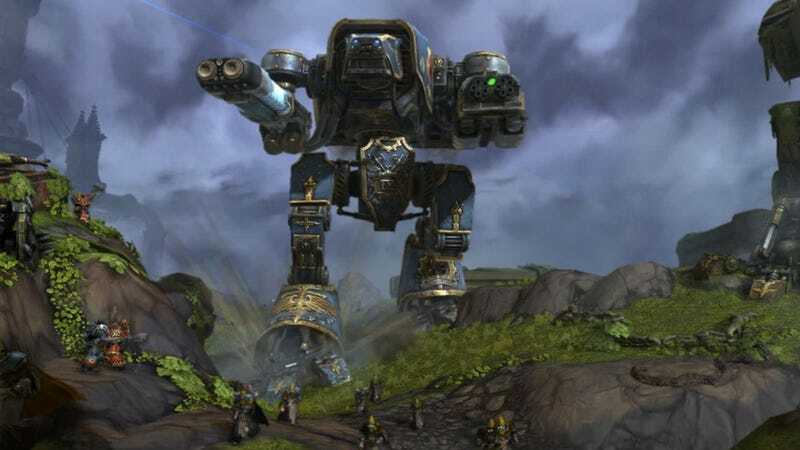 Kevin Dent, a games industry veteran, tweeted late yesterday that THQ had canceled an MMO it was developing under license from The Games Workshop, meaning Warhammer 40,000: Dark Millenium Online (pictured above). Dent went on to say that the publisher had also canceled all projects due for release in 2014 and was in the process of returning intellectual property to their licensors. [Update] THQ's chief spokesperson has issued a statement denying the rumor that it has canceled its 2014 projects. The remainder of the original post follows. The purpose, Dent alleged, was to ready THQ for sale. "I am hearing everything (in 2014 is canceled), they need to preserve cash," he said. Dent noted THQ's stock price is around 66 cents; it was about $6 this time last year. Games THQ publishes under license include the Warhammer 40,000 series as well as the WWE and UFC lines, both of which are under exclusive license. Other games THQ publishes include the Red Faction and Saints Row series. In October 2010, it opened a studio in Montréal, luring away Patrice Désilets from Ubisoft, where he had been creative director of Assassin's Creed. Kotaku has contacted THQ representatives for comment. Any they make will be updated here.